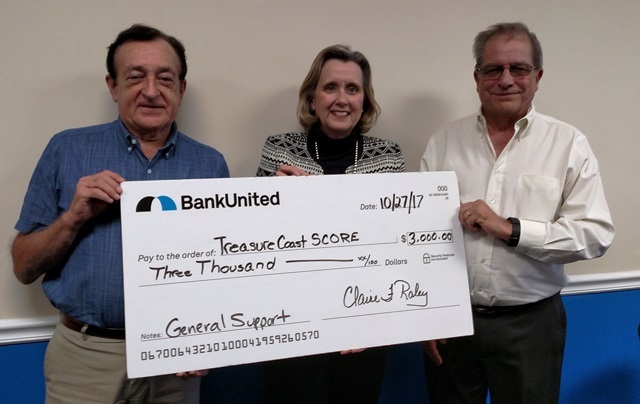 On October 27, 2017, Claire F. Raley, SVP, Community Development and Outreach, BankUnited, presented a check for $3,000 to Robert McCabe, SCORE Vice-Chair and Treasurer, Ken Koziol, Chapter Chair to support the Chapter’s small business education and technical assistance programs. BankUnited, headquartered in Miami Lakes FL with several offices on the Treasure Coast, strives through their Community Development Program to provide a positive foundation for neighborhoods and to engage communities by providing financial support and actively supporting the development goals of the communities they serve. Treasure Coast SCORE mentors have direct experience in business start-ups, manufacturing, high technology, insurance, public relations, retail operations, textiles, pharmaceuticals, legal, banking, hospitality, restaurants, finance, tax, distribution, information technology, materials, engineering, sales & marketing, specialty retailing, acquisitions, turnarounds and divestitures. SCORE Chapter 308, has its main office in Ft. Pierce and eight branch locations in Hobe Sound, Jensen Beach, Palm City, Port St. Lucie, St. Lucie West, Stuart, Sebastian, and Vero Beach. Fiscal year to date September 30, 2017, Treasure Coast SCORE Chapter 308 has served 888 unique mentoring clients, held 120 workshops with 1921 attendees, for total of 4433 total services provided to the small business community of the Treasure Coast. That’s a record for the chapter and represents a year to year growth of 5.1%. SCORE provides no-cost, confidential business mentoring with expertise in a wealth of business and business-related areas. SCORE Chapter 308 is a resource partner with the Small Business Administration and covers Martin, St. Lucie, Indian River, Glades and Okeechobee Counties on the Treasure Coast. Please phone the SCORE office at 772-489-0548 to set up an appointment to discuss your business opportunity with an experienced SCORE counselor or please go to our Web Site www.treasurecoast.score.org.